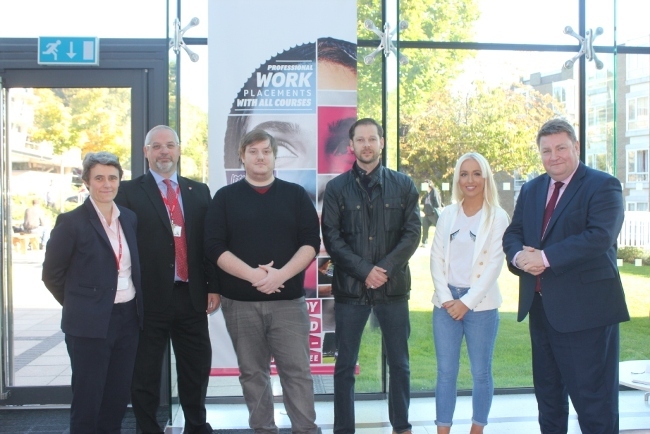 Two exceptional students from Leeds Trinity University have been awarded the Ken Hodgson Memorial Prize for Business which recognises academic excellence and services to the community and business. Emily Outram, a third-year Business and Management student, and Richard Todd, who is in the final year of a degree in Accounting and Business, were both presented with a cheque for £250 by Tim Hodgson, Director of the Westcourt Group, son of the late Ken Hodgson and Leeds Trinity Honorary Fellow and alumnus. Emily, 20, was recognised for academic excellence after gaining consistently high grades throughout her time at University. Richard was recognised for his work in the community with Ahead Partnership, a social enterprise using partnership as an engine for social and economic change. After completing his University placement at Ahead Partnership Richard was offered part-time work with the organisation and is committed to developing a career in the voluntary sector. The Ken Hodgson Memorial Prize was established in 2012 in memory of Ken Hodgson, the founder of the commercial property investment company Westcourt Group Ltd, who was also a Governor at Leeds Trinity University. Every year a Leeds Trinity student is awarded the £500 prize in recognition of their hard work, academic achievements and employability skills. This year, the award has been given to two students who have excelled. Tim Hodgson said: “Business was my dad’s passion which is why we set up this annual award. It’s been going for seven years and I hope it makes a difference to Leeds Trinity students who share his passionate for business. Andy Gilliland, Academic Group Leader for Business, Management and Marketing at Leeds Trinity University, said: “Richard is an excellent ‘all round’ student, achieving high marks for his academic work as well as playing a key role as subject representative. His work with social enterprise is particularly valued in the wider community and his commitment to working with those in difficult circumstances is a credit to the University.